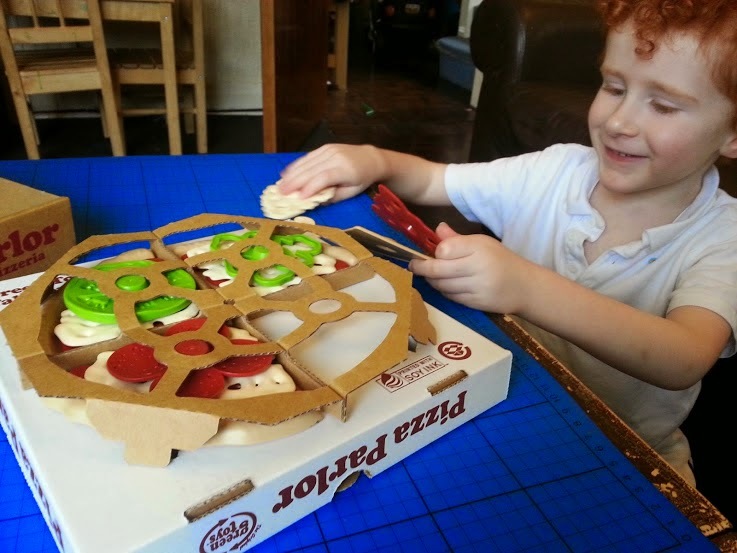 Our latest review for Green Toys is a fabulous one. We've had a very special delivery recently - and it is made from 100% recycled plastic milk bottles and 100% recycled cardboard printed with soy ink. 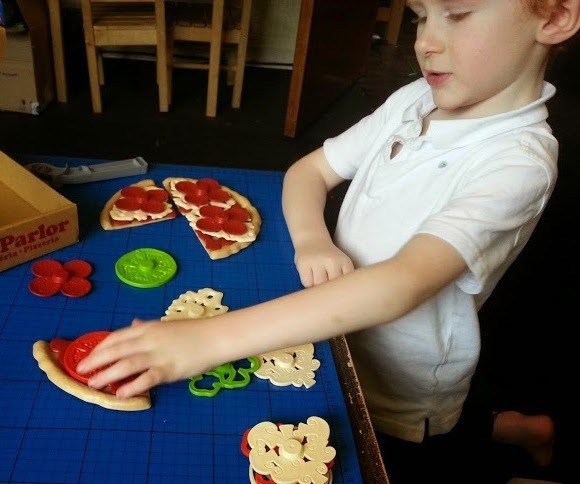 The Green Toys Pizza Parlour is a lovely set which allows you to serve up a 100% recycled plastic pizza with loads of delicious toppings to your friends and family. 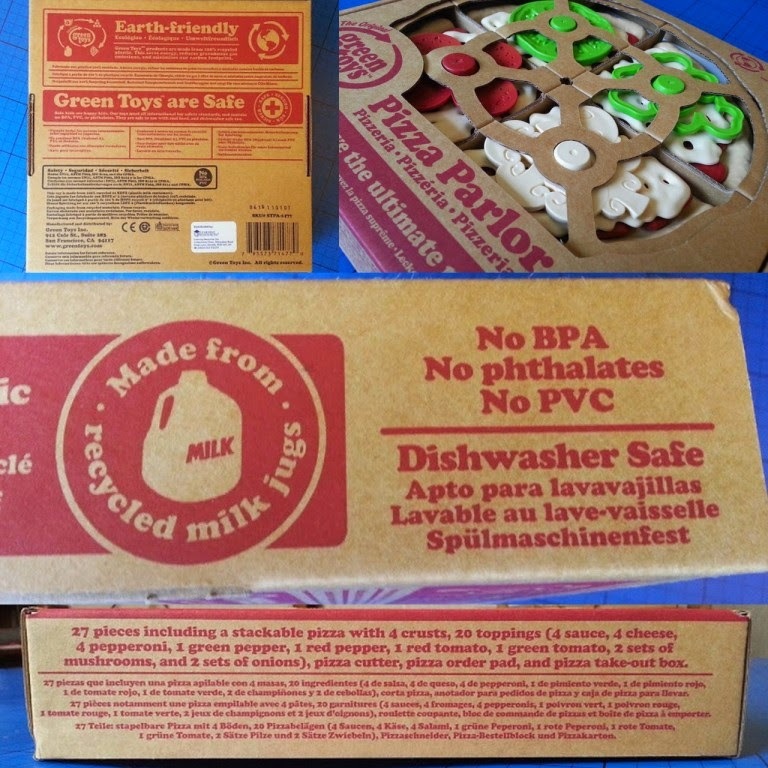 As ever the packaging is fantastic, explaining everything about Green Toys - including how they are made from recycled milk bottles, are food safe and dishwasher friendly. This packaging is even better though. It's really clever. 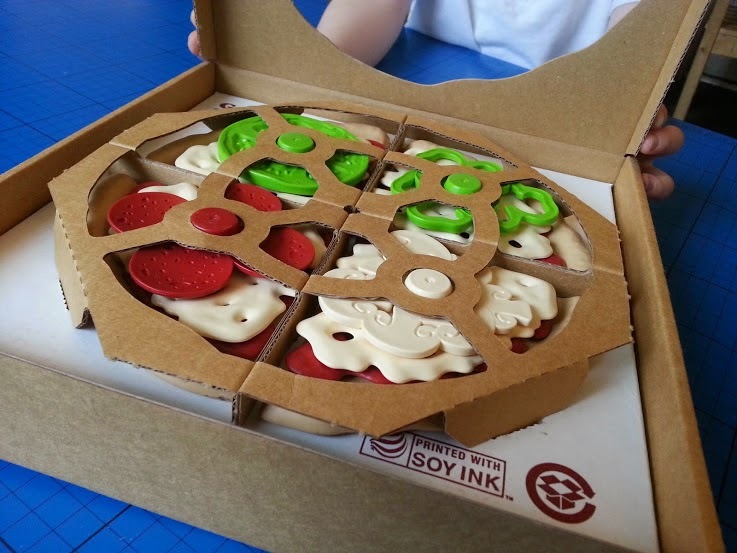 The white box lifts out as a whole piece, and then you can unpack your pizza. 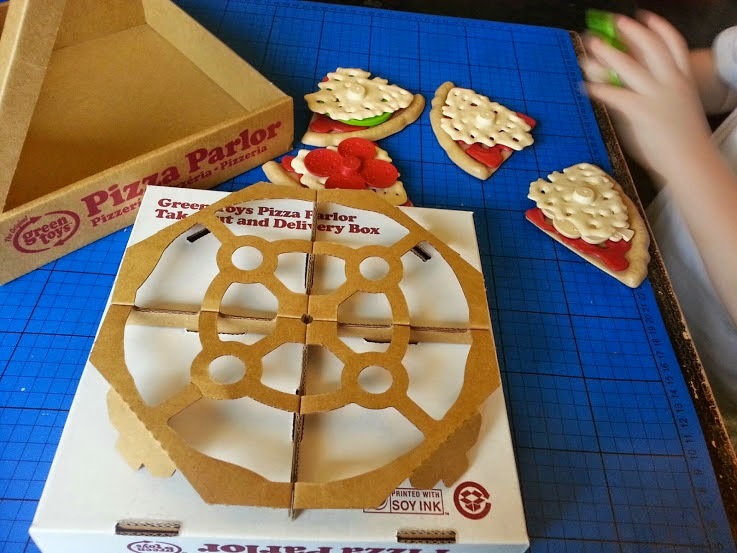 It's a pizza box! And it has a host of extra ingredients inside. The pizza stacks really nicely - all of the toppings sit on top of each other on the pizza base in any formation you desire. 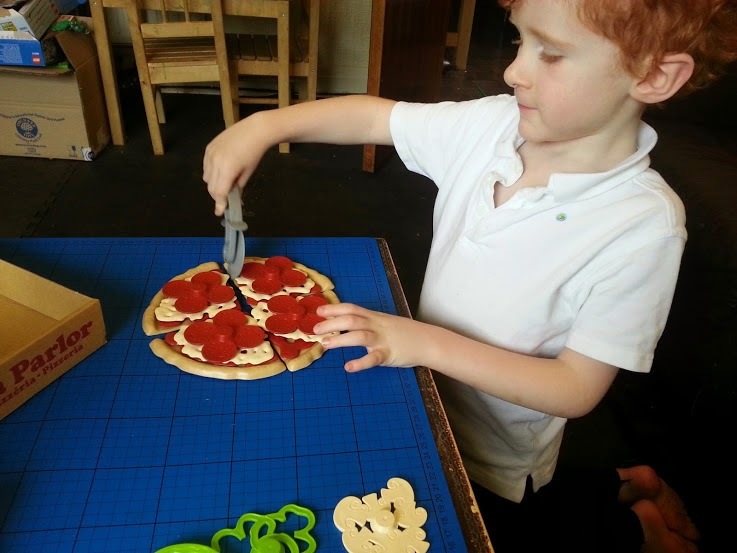 As well as pizza ingredients it has a pizza cutter and a pad of order forms with writing and pictures...brilliant for getting younger children used to reading and recognising words, and encouraging mark making and writing - as well as role play. 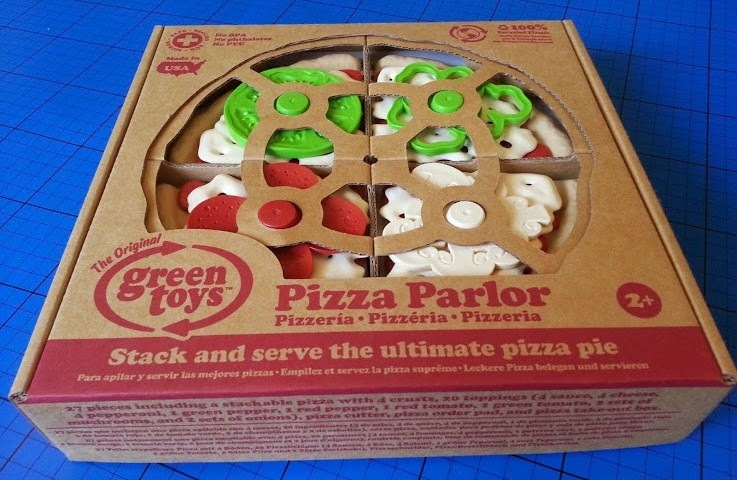 The amount of different toppings and pieces in this set is huge. 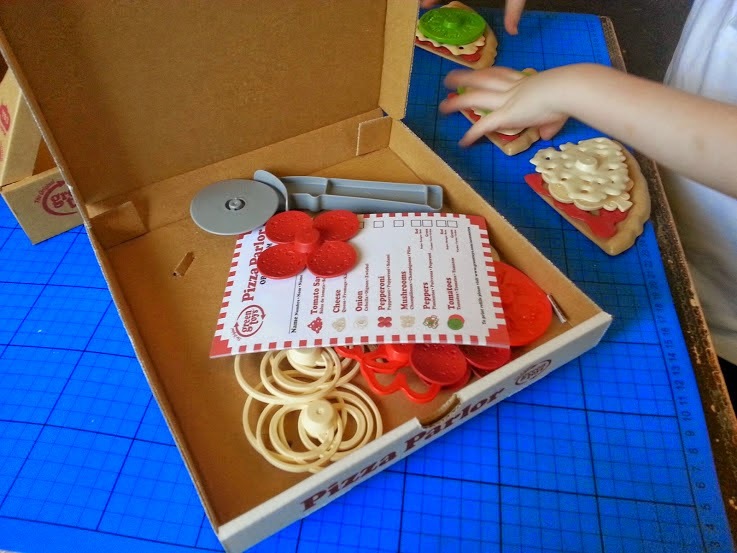 Ample for your child to create whatever pizza they fancy. 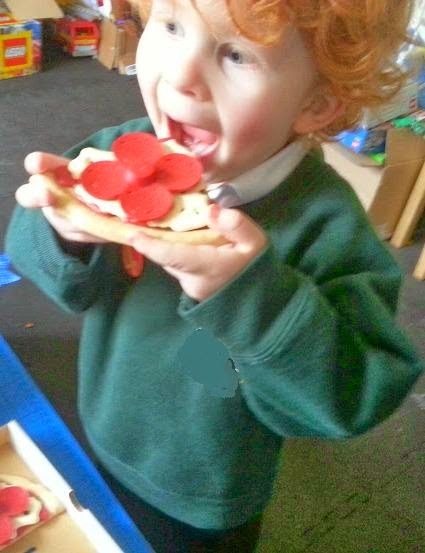 If only all real pizzas were guaranteed to have so much on them! This is a great set for encouraging children to learn about different vegetables, and think about how food is made. 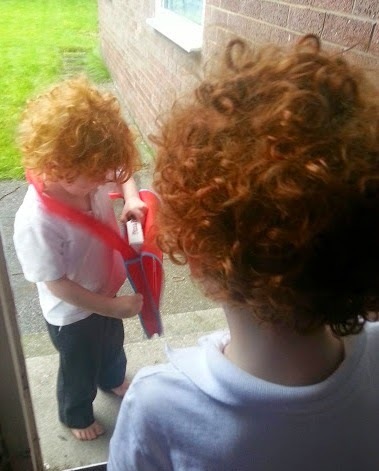 Hopefully they'll recognise real life veg when they're eating and be more tempted to accept and try it. 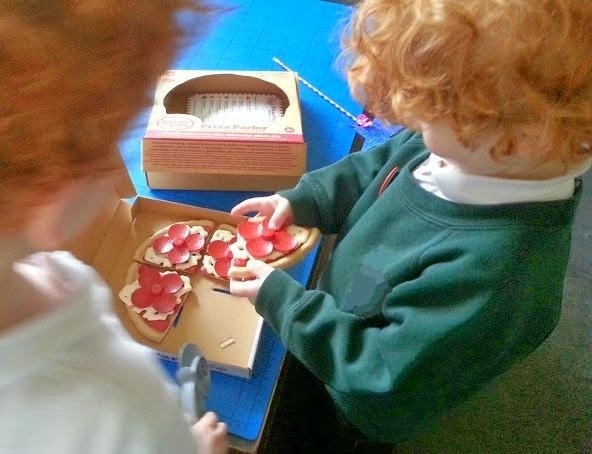 There are several different forms of role play involved with this set too - cook, shopkeeper, delivery person, customer, eating a meal, having a treat, watching a movie. It really gets their imaginations fired up. 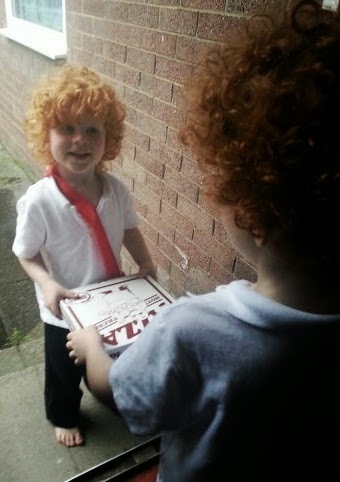 When the pizza's ready, it can go into the box to be delivered! 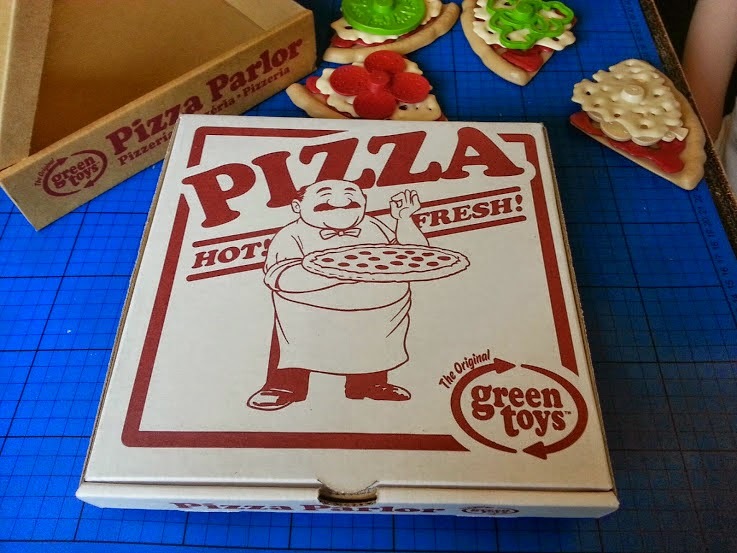 The Green Toys Pizza Parlour is suitable for ages 2+ and can last your child a really long time. 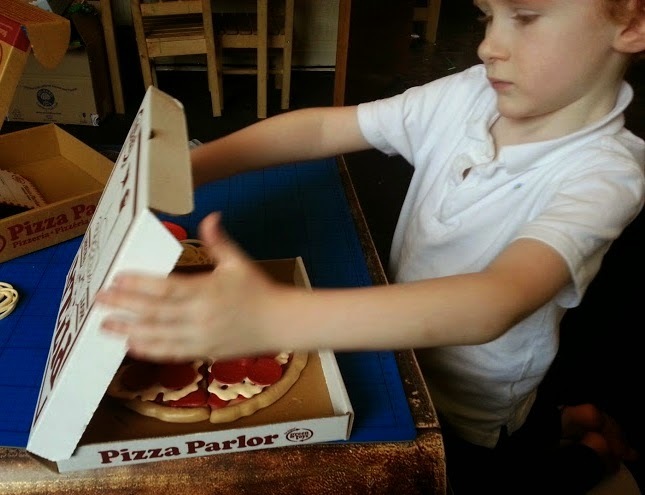 It's really well made, very clever and my boys love it, they've 'cooked' nothing but pizza since we got it, 'eating' pizza on the lawn as well as inside. The fact it's so lifelike means they don't in any way consider it a baby toy like some other play foods. 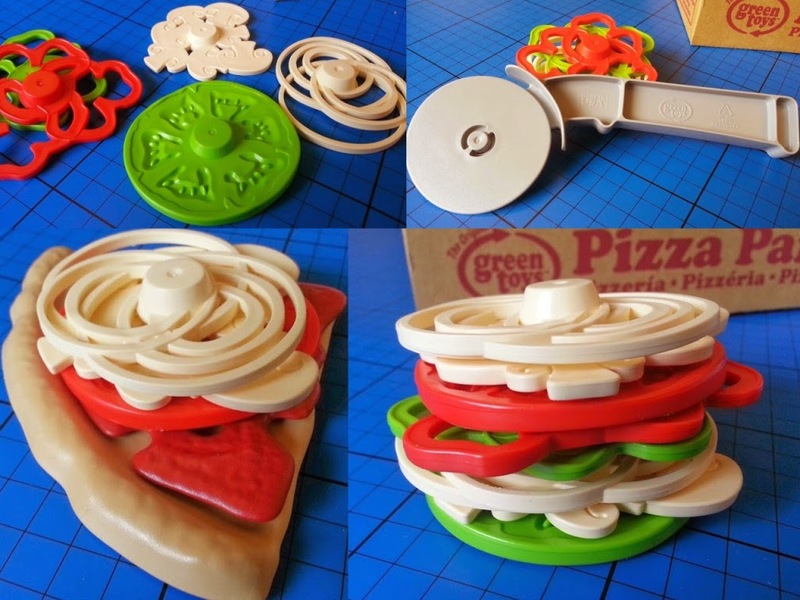 Pizza Parlour retails at £19.99 and for what you get I really think that's money well spent. 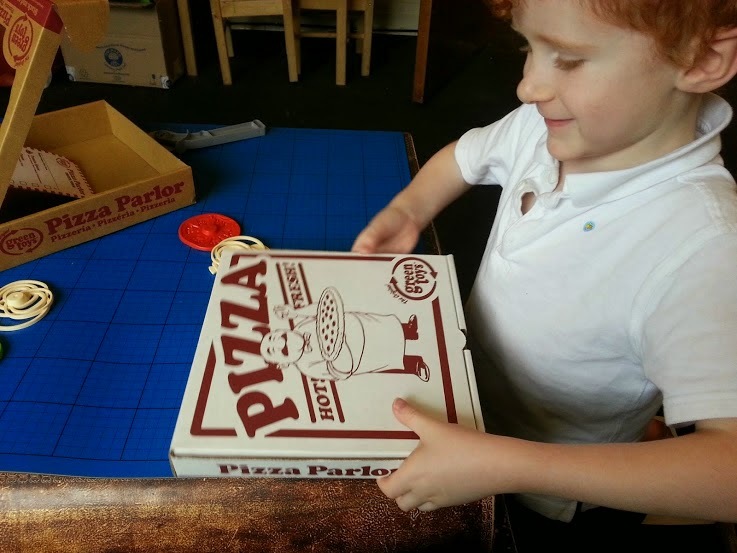 That looks like a lovely toy - love that it comes with a pizza box and an impressive amount of toppings! I think any child would love this and have loads of fun playing with it. What a brilliantly designed toy, and I love the box. I know how much my boy would have loved this when he was small as he loved anything to do with cooking and serving up pretend food. That looks like so much fun and I love the packaging! My two would love playing with this! This looks awesome! 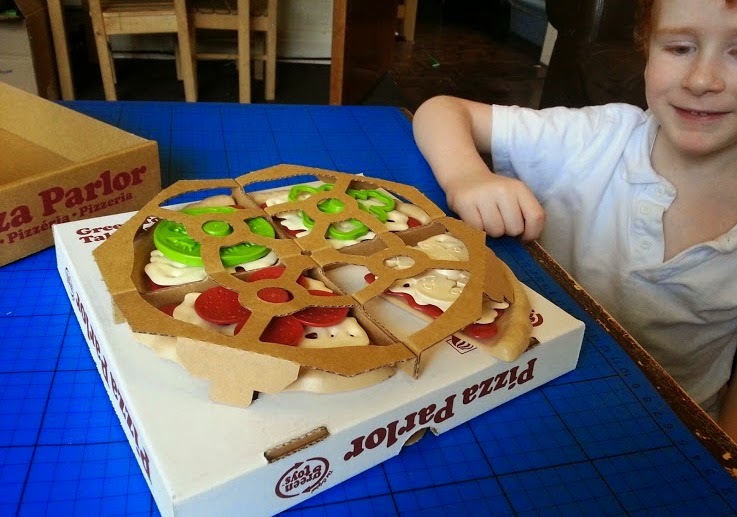 A must for any pizza loving family! 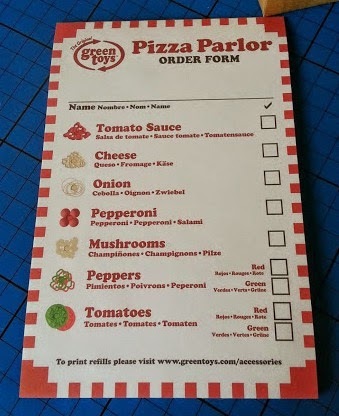 It's perfect for my two - pizza night is a big favourite here!